When you get home from a vacation, you inevitably think about everything you should have done differently. You should have stayed in a more charming part of town, found a cheaper hotel, taken more hikes, bought a couple of souvenirs, splurged on better restaurants. You should have made more of an attempt to learn the local history or speak the language. You should have branched out, tried new things, eaten more adventurously. Like maybe, when I went to France for the first time, I should have eaten something other than a warm chèvre salad for lunch every day. Of the many traveling regrets I’ve had, my week of eating chèvre chaud salads is not one of them. Warm, creamy goat cheese smeared on assaultingly crunchy baguette croutons and a pile of lightly dressed greens; could there be a more perfect lunch or a more satisfying salad? I think not. No reason to reserve the chèvre chaud salads for trips to France. We can make it at home, no problem. Turn on the oven. Asparagus is finally looking good, so we’ll incorporate a few spears into the salad. Drizzle with olive oil, sprinkle with salt and pepper, and roast. Throw a handful of walnuts on the baking sheet to toast while you’re at it. Baguette will get sliced and baked ’til crunchy, then topped with rounds of fresh goat cheese and broiled until warm. Toss arugula with a couple of slices of shallot, dress with olive oil and drops of balsamic vinegar. We’re ready to assemble. Put it all together. 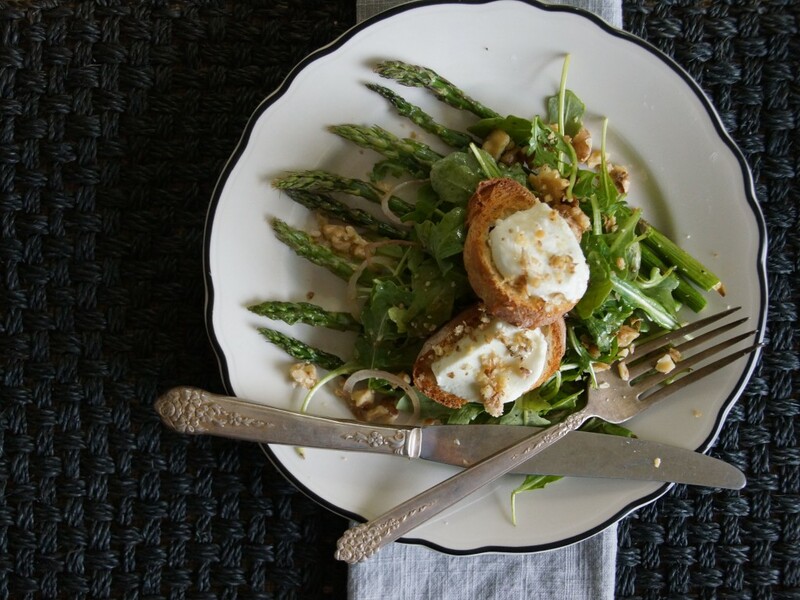 Roasted asparagus spears make the base, dressed greens get mounded in the center, and the chèvre croutons are placed right where they belong: front and center. Smash the walnuts and sprinkle them over the top. Drizzle the warm cheese with honey and you are good to go on your mini-French getaway. Why stop at a week? Home or away, I will happily eat my beloved chèvre chaud salads for life. Because this salad is as great for a solo lunch as it is for a group, I omitted specific measurements. If you are serving the salad as a main course, I'd allow about 8 spears of asparagus per person and 2 chèvre croutons. On a baking sheet, lightly drizzle asparagus with olive oil, season with salt and pepper. Place baguette slices and walnuts on the baking sheet and bake for 5 minutes, until the walnuts are fragrant and the bread has started to turn golden. Remove and reserve the toasted walnuts. Flip the bread and top with the goat cheese. Turn your broiler to high and return the baking sheet to the oven for about 5 minutes, until the cheese is warm and the asparagus is roasted but still slightly crisp. Meanwhile, dress the salad. Toss the arugula, shallots, and half of the toasted walnuts with olive oil, salt, and pepper, to taste. Add a few drops of balsamic vinegar, toss to coat. Arrange the roasted asparagus spears on a plate or platter. 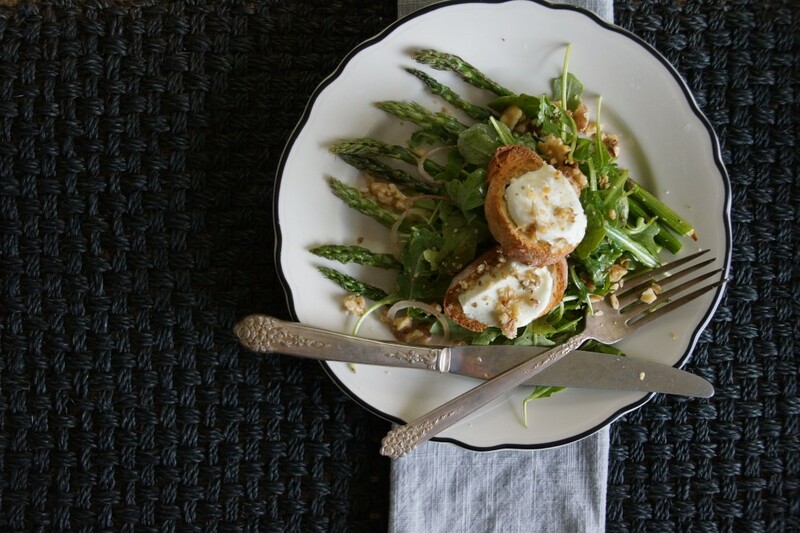 Mound the dressed arugula over the asparagus. Top with the goat cheese croutons. Drizzle the cheese with a little honey and sprinkle with the remaining nuts. I loved this salad! Had it last night, your crazy fan, Pam, made it. I think I will add beets in the future! Good idea with the beets–that would be beautiful! Glad you liked the salad. This looks crazy good. I love your Provence pictures, I should post some of my own. Le sigh… We have a snowstorm rolling in here as I speak, I can utterly relate to your other post about lack of spring..